Respiratory care is a branch of allied health concerned with the assessment, management and treatment of a patient’s breathing. As specialists in the field, respiratory therapists use both evaluation and therapeutic techniques to help patients deal with a range of breathing issues, from emphysema in adults to underdeveloped lungs in newborn children. Today, nearly 120,000 individuals are employed as respiratory therapists in the U.S., with more than 75 percent working in general medical and surgical hospitals. A growing profession, the Bureau of Labor Statistics projects double digit growth national between 2012 and 2022. The following guide serves as a high-level introduction to educational options available in respiratory therapy, certification and specialization opportunities, and an interview with a program director of a respiratory therapy program. After Respiratory Therapist School: What’s Next? Studying to become a respiratory therapist may be beneficial to those looking to work with state-of-the-art technology while providing medical assistance to patients. Since respiratory care is a growing healthcare field, there are many respiratory therapy schools for students to choose from. To make this choice easier for prospective students, we have found the top schools in this field by analyzing every program in the country based on our criteria. Find the best respiratory therapy school below. Northern Michigan University offers an online and on campus bachelor's degree in respiratory therapy program for individuals with an associate degree. It can help current respiratory therapists transition into management or education positions. This program offers a variety of courses including introduction to clinical health management, organizational behavior and management, and human anatomy and physiology. Once students earn the 120 required credit hours for this degree, they will have the enhanced critical thinking skills needed to advance in their careers as respiratory therapists. Middle Georgia State University offers 2 respiratory therapy degree programs online and on campus. The bachelor of science is an entry-level program that requires 60 hours of prerequisites. It can be completed in 5 semesters and prepares students to earn the Certified Respiratory Therapist (CRT) credential. The second program is an associate to bachelor of science bridge program that is designed for working respiratory therapists who would like to earn a bachelor's degree. This program includes partially online courses and only requires students to come to campus once a month. Upon completion of this program, graduates may sit for the National Board of Respiratory Care specialty exams. The Respiratory Therapy Assistant AAS degree at the University of the Incarnate Word is designed for students who would like to pursue careers as respiratory assistants. It is an 84 credit hour program that includes general education courses, introductory courses, program courses, practicum courses and community service. Students who apply for this program will be evaluated on a number of factors including GPA, ACT and/or SAT scores, extracurricular activities, work experience and optional letters of recommendation. Once they graduate with their Associate in Applied Science, students will be eligible to sit for the Therapist Multiple-Choice Examination, which will allow them to earn the Certified Respiratory Therapist (CRT) credential. Kettering College allows students to earn a 3-year bachelor of science in respiratory care online or on campus. Through this program, students can gain the technical knowledge and clinical experience they need for successful careers as respiratory therapists. High school or college GPA, ACT or ACT test scores, a strong academic background in math and basic science, a minimum score of 70 on the Kettering College math placement exam, a personal statement and job experience will all be taken into consideration for acceptance into the program. Upon completion of the required 132 credit hours, students can sit for the Therapist Multiple Choice exam and earn the Certified Respiratory Therapist (CRT) credential. Rhode Island College offers a respiratory therapy completion program online and on campus. To enroll in this bachelor of science degree, students are required to have a respiratory therapist license and 42 transfer credits. Human genetics, social and global perspectives on health, society and social behavior, and dynamics and determinants of disease are several examples of this program's required courses. Upon completion of the 91 credits, students should be eligible for enhanced job opportunities, promotions and/or leadership positions. Dalton State College offers an online and on campus program that is designed for respiratory therapists who have completed an Associate of Science degree in respiratory therapy and have already become registered respiratory therapists. The purpose of this unique program is to give respiratory therapists the opportunity to earn a Bachelor of Science in respiratory care without duplicating their current knowledge and skills. Upon completion of the 122-123 credit hours required for this program, students will have the enhanced critical thinking skills needed to become leaders in the field. George C. Wallace Community College offers a 5 semester, 76 credit hour, online or on campus Associate in Applied Science degree for students who are interested in becoming respiratory therapists. A number of factors are used to determine an applicant's acceptance into this program, including grade point average, completed courses and performance on the ATI Test of Essential Skills. Students who complete their Associate in Applied Science degree gain the skills and clinical training necessary to serve as physician's assistant in the planning, implementation and evaluation of respiratory therapy. They are eligible to take the Therapist Multiple-Choice Examination and earn the Certified Respiratory Therapist (CRT) credential. Seattle Central College offers an online and on campus Bachelor of Applied Science in Allied Health degree. The respiratory care track of this program allows students to gain the knowledge and hands-on experience they need to treat patients with heart and lung disorders. To apply for the respiratory care track, students must submit the results of a Test of Essential Academic Skills (TEAS) and complete 12 prerequisite courses with a GPA of 2.0 or higher. After earning 180 credit hours, students will earn their bachelor's degree and be qualified for jobs as a respiratory therapist. Keiser University offers an associate of science degree in respiratory therapy online or on campus. The prerequisites for this program include a cumulative grade average of 3.0 on a 4.0 scale and the passage of a background check and drug screening. Examples of some of the required courses include Human Anatomy and Physiology I and II with at least a "B" in each course. For general education coursework, a minimum grade of "C" for each course is required. Students may graduate from this program after earning 76 credit hours. Following graduation, they may sit for the Registered Respiratory Therapist exam and apply for a state license to be eligible for employment. Vermont Technical College gives prospective students the opportunity to earn an associate of science degree in respiratory therapy online or on campus. For acceptance into this program, students must place into ENG 1060 or 1061, achieve a level 2 math placement and be willing to travel to hospital sites. After completing 69 credit hours and gaining valuable experience providing patient care under supervision in Vermont, New York and New Hampshire, students will graduate and be eligible to sit for the credentialing exams offered by the National Board of Respiratory care. Once students successfully complete the credentialing exams, they will receive the Registered Respiratory Therapist credential and be able to apply for licensure. A license will qualify them for a career as a respiratory therapist in Vermont or New Hampshire. 200-level. Graduates from 200-level programs are eligible to sit for the National Board for Respiratory Care Certified Respiratory Therapist (CRT) and Registered Respiratory Therapist (RRT) credentials. 300-level. These programs are conducted at satellite locations separate from the main location where all respiratory core class and laboratory coursework are offered. Does not include completely online distance or online education programs. 400-level. Graduates in 400-level programs develop core competencies of sleep disorder specialists and are eligible to take the National Board for Registry Care’s Sleep Disorders Specialty (SDS) credential and the Board of Registered Polysomnographic Technologist’s Registered Polysomnographic Technologist (RPSGT) credential examinations. According to the most recent report from the CoARC, there are a total of 441 accredited respiratory therapy educational programs as of December 31, 2013. These degree programs are sponsored both by private and public institutions of higher education, as well as the U.S. Air Force and U.S. Army. Members of the various branches of the Armed Forces (Army, Navy, US Army Reserve) can pursue training through the Interservice Respiratory Therapy Program (IRTP), which is a comprehensive educational program that prepares enlisted personnel to become qualified respiratory care practitioners. Also called technical or medical institutes, vocational schools offer career-focused training programs—diploma, certificate, and associate degrees—that allow students to seek entry-level positions of employment after graduation. Respiratory therapy programs at these institutions integrate classwork, laboratory experiences, and clinical practicums to prepare students to quality for the entry-level Certified Respiratory Therapist (CRT) and the subsequent advanced Registered Respiratory Therapist (RRT) credentialing examinations from the National Board for Respiratory Care. Unlike vocational schools or technical institutes, community colleges traditionally offer a more extensive selection of academic-focused degree options. In the respiratory therapy fields, community colleges typically provide students with two associate degree tracks, an Associate in Applied Sciences in Respiratory Therapy (AS) and the Associate of Science in Respiratory Therapy (AS). The AAS is a career-oriented professional degree, while the AS is a research-focused degree that can be transferred into a bachelor’s degree program in the future. Both are two- to three-year programs of study that qualify graduates to sit for credential examinations from the National Board for Respiratory Care. Public and private colleges and universities afford students the opportunity to complete a bachelor’s degree in respiratory therapy or care. Generally speaking, four-year institutions provide a more extensive scope of academic curriculum, curriculum that blends a foundational education in the liberal arts with professional coursework in respiratory therapy. Colleges and universities typically have two educational avenues for students—two-year bachelor’s degree completion programs for students with an associate degree and NBRC certifications and four-year bachelor’s degree programs for the first-time professional in respiratory therapy. It’s also important to note that 47 four-year public and private universities offer an associate degree program in respiratory therapy, as well. For prospective respiratory therapists and experienced RRTs considering a bachelor’s or master’s degree program, there are numerous factors to be considered prior to making a decision including location, cost, clinical practicums available and strength of curriculum. The American Association for Respiratory Care provides an outline of questions students should ask program directors prior to applying. Below is a list of five of the top factors respiratory therapy schools should have. The Commission on Accreditation for Respiratory Care (CoARC) is the primary accrediting body for schools of respiratory therapy. As the accrediting agency, CoARC ensures institutions offering respiratory therapy degree and training programs maintain a national standard of educational quality and achieve their stated learning outcomes. Students should check the university’s or college’s accreditation status via the CoARC prior to applying. As noted above, the National Board for Respiratory Care has two certification examinations, the Certified Respiratory Therapist (CRT) and Registered Respiratory Therapist (RRT). Prospective students should ask about the institution’s pass rate for both first-time and repeat NRBC test takers. Low passage rates may indicate the respiratory therapist school’s inability to prepare students for real-world success. Although most curriculum is generalist in nature, there are subspecialties within the field of respiratory care. During clinical rotation, students traditionally have the opportunity to complete internships in an area of interest. Of the total number of clinical practicum hours available, students should investigate the percentage dedicated to specialty areas of practice, such as pediatric critical care, diagnostics (e.g, pulmonary function testing, sleep disorders), home health care, adult general care, etc. The best programs are dedicated to the success of their students, which encompasses everything from the classroom environment to faculty members, job placement assistance to preparation for post-graduation certification. Prospective students should check the instructor-to-student ratio for classroom-instruction, laboratory instruction and clinical practicums. That information sheds insight into the type of learning experience students will receive. Secondly, the admission, graduation, and job placement rates should not be overlooked. Is the program competitive? Is it graduating students? Are those students finding jobs? Those are very important questions to ask. 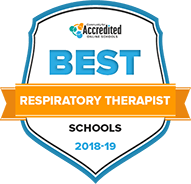 As noted above, the associate degree is the most common educational avenue for registered respiratory therapists, and the total number of degree programs is a reflection of that point. According to CoARC, 85 percent of all accredited degree programs are at the associate degree level, followed by bachelor’s degrees (13 percent). A two-year program in respiratory therapy typically results in an Associate in Applied Science (AAS) or Associate of Science (AS) degree. Curriculum is divided between coursework in areas such as respiratory therapy principles, anatomy and physiology, respiratory therapy procedures, laboratory experience and hands-on clinical rotations. Individuals with an associate degree in respiratory therapy are eligible to sit for the CRT certification examination from the National Board for Respiratory Therapists and, subsequently, the RRT certification examination. Additionally, graduates with an Associate of Science can use their degree as a starting point to pursue a bachelor’s degree in the field. Bachelor’s degrees in respiratory therapy are less common than associate degree programs. They are typically available in two formats: a four-year first-professional degree program and a two-year degree completion format for students who hold an associate degree in respiratory care or science. Generally speaking, universities offer either a Bachelor of Science in Respiratory Care (BSRC) or a Bachelor of Science in Respiratory Therapy (BSRT).Broadly, four-year degree programs are designed for individuals with no prior experience in respiratory care. In turn, curriculum is traditionally split between a pre-professional year of study (general education coursework), followed by three years of professional coursework. In addition, students are required to complete a practicum consisting of several clinical rotations where they apply their classroom-based instruction in acute care settings. Degree completion programs, known as RRT-to-bachelor degree completion programs, are designed for the registered respiratory therapist seeking to complete a four-year program of study. Aimed at the working professional, most programs credit students for both their completed associate degree coursework and RRT credential. Generally speaking, students must complete between 30-36 credit hours of study, which can be finished in approximately two years. Curriculum concentrates on advanced coursework in respiratory care, ranging from sleep medicine to quality improvement in healthcare, leadership principles to a critical review of respiratory therapy research. As of 2013, only three universities offered accredited master’s degree programs in respiratory therapy: Rush University, University of Mary and Georgia State University. The goal of each of these degree programs is to prepare graduates to pursue advanced careers as respiratory care practitioners, educators, researchers or experts in a clinical specialization. Divided between knowledge-based and professional clinical training, the curriculum is designed to enhance RRT’s experience in the field, positioning graduates for career advancement opportunities. Typical day in the life. Broadly, graduates of respiratory therapists develop core skills aligned with the scope of practice in respiratory therapy, including: patient assessment, patient data evaluation, therapeutic procedures, equipment manipulation, infection control, patient safety and quality control. According to O*NET, 83 percent of respiratory therapists hold an associate degree, 12 percent have a bachelor’s degree, and 5 percent have a post-secondary certificate. Below is a list of resources for prospective respiratory therapists, including lists of accredited programs, state licensing contacts, and information about certifications. Respiratory therapists in this field are responsible for a range of tasks when working with infants, such intubation, attending high-risk deliveries, ventilator management, transporting patients, administering breathing treatments and more. Caring for children of all ages, pediatric respiratory therapists provide both general (e.g. oxygen therapy, asthma treatment and education, medicated therapy, etc.) and critical care (e.g. ventilation, airway management, medicated aerosol therapy, etc.) to patients. Respiratory therapists working in pulmonary function are responsible for helping to diagnose, monitor and treat lung diseases. Using a variety of tools and methods, respiratory therapists administer respiratory treatments, conduct diagnostic tests (e.g. cardiopulmonary exercise tests, spirometry) and provide educational services to patients. Launched in 2012, the RRT-ACCS is designed for the experienced RRT working in the field of adult critical care. The examination focuses on the core competencies within the adult critical care setting and not the general practice of respiratory care. To be eligible, candidates must be a Registered Respiratory Therapist (RRT) with at least one year of professional experience. This entry-level examination measures the basic skills and knowledge of pulmonary function technologists. It covers major areas of practice including data management, instrumentation, and diagnostic procedures and includes 115 multiple choice questions. This credential is for both Certified Respiratory Therapists (CRT) and RRTs working in neonatal or pediatric care. The 140 multiple-choice test covers three areas: therapeutic procedures, clinical data and equipment. A credential for individuals holding the Certified Pulmonary Function Technologist (CPFT) certification, this examination consists of 115 multiple-choice questions that cover data management, diagnostic procedures and equipment. Created in 2008, this certification is designed for respiratory therapists working with individuals dealing with sleep disorders. In order to be eligible, candidates must either be a CRT or RRT with an accredited degree that includes a sleep disorder add-on track, be a CRT with at least six months experience, or be an RRT with at least three months experience. Catherine Kenny, PhD, is a graduate of Kent State and holds a graduate certificate from the University of Chicago's respiratory therapy program. She has more than 30 years of experience in higher education and has served as the program director for the respiratory therapy program at Lakeland Community College since 1992. She currently serves as both administrator and professor for the college. A licensed respiratory care practitioner, Dr. Kenny holds a national registry in respiratory care. Could you discuss current trends and employment opportunities in the field? Respiratory care is an allied health career with entry at the associate degree level. The field specializes in the care of heart and lungs. Therapists work with patients running the lifespan, from the newborn to the elderly. Practitioners in this profession work under the guidance of a physician in the application of therapies and administration of medications affecting the heart and lungs. I see the profession moving eventually to the bachelor’s degree as the educational minimum for entry to employment as the role becomes increasingly technical. Care will also move to outpatient and home care settings as medicine shifts in that direction. The Bureau of Labor Statistics lists physician’s assistant (PA) role as the career ladder for this profession, which is a master’s-level position. Other potential roles include: educators, supervisors and managers, medical marketing sales. We’ve had graduates from our program take positions on heart/lung transplant teams, in vascular labs, as medical research coordinators/assistants, anesthesia assistants, physician assistants and even emergency room physician. We also have an individual that went on to work in medical malpractice as a medical defense lawyer. We have had graduates pursue research and present and publish research internationally. How does a respiratory degree prepare students for real-world careers? Students enrolled in respiratory programs spend time in a variety of clinical settings where they work with patients under the guidance of therapist preceptors. Examples of clinical experiences include: basic floor therapies including medication delivery, intensive care rotations where students work with patients on life support equipment, home care visitations for patients on respiratory home care and oxygen, sleep labs, and pulmonary diagnostic laboratories. They often accept positions within these settings after graduation. Once in a facility they often have the ability to move to various positions depending upon their area of interest, expertise and education. Therapists must continue their education in the profession upon graduation through continuing education. They are also free to pursue additional degrees depending upon their areas of interest. After graduation, students must complete certification and state licensing requirements in order to practice as respiratory therapists in their state. Below is a discussion of the licensing process and employment trends in respiratory care. Certification and Licensure. The practice of respiratory therapy is regulated at the state level, including all states except Alaska. Licensing requirements vary by state, so prospective students should have an understanding of their state’s requirements prior to enrolling in a respiratory therapist training program. Most states require students to be certified by NBRC and at least a two-year degree from an accredited institution. Additionally, many states—such as Louisiana—have shifted away from two licensure categories for respiratory therapists (RRT and CRT), but now only use a single licensure category of Licensed Respiratory Therapist (LRT) or Licensed Respiratory Care Practitioners (RCP). sense of self- motivation. Unlike other health professions, the therapist often works alone with patients and may be in various intensive care units, medical floors and emergency or outpatient clinics throughout a single day. The profession is 24/7 meaning that any individual entering into this line of work will with great probability, work every shift every day of the year over a career life-span. Mechanical ventilation, or life support, is the application of algebra to pathology and utilizes principles of physics. A solid foundation in math and science is a must. As therapists are independent in the hospital they must be able to communicate with other health professionals. They are also called upon to teach patients how to use various devices and need to be able to communicate effectively.